The Metaphysics is considered to be one of the greatest philosophical works. Its influence on the Greeks, the Muslim philosophers, the scholastic philosophers and even writers such as Dante, was immense. It is essentially a reconciliation of Plato's theory of Forms that Aristotle acquired at the Academy in Athens, with the view of the world given by common sense and the observations of the natural sciences. According to Plato, the real nature of things is eternal and unchangeable. However, the world we observe around us is constantly and perpetually changing. Aristotle’s genius was to reconcile these two apparently contradictory views of the world. The result is a synthesis of the naturalism of empirical science, and the rationalism of Plato, that informed the Western intellectual tradition for more than a thousand years. At the heart of the book lie three questions. What is existence, and what sorts of things exist in the world? How can things continue to exist, and yet undergo the change we see about us in the natural world? And how can this world be understood? Aristotle encountered the theory of forms when he studied at the Academy, which he joined at the age of about 19 in the 360s B.C. Aristotle soon expanded on the concept of forms in his Metaphysics. He believed that in every change there is something which persists through the change (for example, Socrates), and something else which did not exist before, but comes into existence as a result of the change (musical Socrates). To explain how Socrates comes to be born (since he did not exist before he was born) Aristotle says that it is ‘matter’ (hyle) that underlies the change. The matter has the ‘form’ of Socrates imposed on it to become Socrates himself. Thus all the things around us, all substances, are composites of two radically different things: form and matter. This doctrine is sometimes known as Hylomorphism (from the Greek words for "matter" and "form"). It is notoriously difficult to specify the date at which Aristotle wrote these treatises as a whole or even individually, especially because the Metaphysics is, in Jonathan Barnes' words, "a farrago, a hotch-potch", and more generally because of the difficulty of dating any of Aristotle's writings. In the manuscripts, books are referred to by Greek letters. The second book was given the title "little alpha," apparently because it appears to have nothing to do with the other books (and, very early, it was supposed not to have been written by Aristotle) or, although this is less likely, because of its shortness. This, then, disrupts the correspondence of letters to numbers, as book 2 is little alpha, book 3 is beta, and so on. For many scholars, it is customary to refer to the books by their letter names. Thus book 1 is called Alpha (Α); 2, little alpha (α); 3, Beta (Β); 4, Gamma (Γ); 5, Delta (Δ); 6, Epsilon (Ε); 7, Zeta (Ζ); 8, Eta (Η); 9, Theta (Θ); 10, Iota (Ι); 11, Kappa (Κ); 12, Lambda (Λ); 13, Mu (Μ); 14, Nu (Ν). 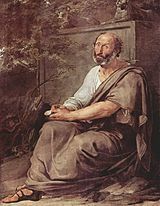 It is possible that Aristotle did not write the books in the order in which they have come down to us; their arrangement is due to later editors, and there is little reason to think that it reflects how Aristotle himself would have arranged them. Based on a careful study of the content of the books and of the cross-references within them, W. D. Ross concluded that books A, B, Γ, E, Z, H, Θ, M, N, and I "form a more or less continuous work", while the remaining books α, Δ, Κ and Λ were inserted into their present locations by later editors. However, Ross cautions that books A, B, Γ, E, Z, H, Θ, M, N, and I — with or without the insertion of the others — do not constitute "a complete work". Many scholars believe that Aristotle's works as we have them today are little more than lecture notes. Many of his works are extremely compressed and thus baffling to beginners. Nowhere is this more evident than in the Metaphysics — Ibn Sina (Avicenna), one of the greatest Medieval Islamic philosophers, said that he had read the Metaphysics of Aristotle forty times, but still did not understand it. Only later, after having read al-Farabi's, Purposes of the Metaphysics of Aristotle, did he understand Aristotle's book. In the 19th century, with the rise of textual criticism, the Metaphysics was examined anew. Critics, noting the wide variety of topics and the seemingly illogical order of the books, concluded that it was actually a collection of shorter works thrown together haphazardly. Werner Jaeger further maintained that the different books were taken from different periods of Aristotle's life. Everyman's Library, for their 1000th volume, published the Metaphysics in a rearranged order that was intended to make the work easier for readers. Some of the earlier scholars of the Metaphysics were Arabs, who relied on Arabic translations from early Syriac translations from the Greek (see Medieval Philosophy). The book was lost in the Latin West from the collapse of Rome until the twelfth century. For a period, scholars relied on Latin translations of the Arabic, particular Michael Scot's translation of Averroes' commentary. These were sometimes inaccurate, having been through so many stages of translation. In the thirteenth century, following the Fourth Crusade, the original Greek manuscripts became available. One of the first Latin translations was made by William of Moerbeke. William's translations are literal, and were intended faithfully to reflect the Greek word order and style. These formed the basis of the commentaries of Albert the Great, Thomas Aquinas and Duns Scotus. They were also used by modern scholars for Greek editions, as William had access to Greek manuscripts that are now lost. Werner Jaeger lists William's translation in his edition of the Greek text in the Scriptorum Classicorum Bibliotheca Oxoniensis (Oxford 1962). ^ Bertrand Russell said that “Aristotle is Plato diluted by common sense”. History of Western Philosophy, chapter 19. ^ W. D. Ross, Aristotle's Metaphysics (1953), vol. 1, p. xxxii. ^ e.g., in Movement of Animals 700b9. ^ Jonathan Barnes, "Life and Work" in The Cambridge Companion to Aristotle (1995), pp. 18-22. "Farrago": Barnes, "Metaphysics" in The Cambridge Companion to Aristotle, p. 68. ^ Aristotle's Metaphysics (1953), vol. 1, p. xxiii. ^ Silvia Fazzo, "Lo Stemma Codicum della Metafisica di Aristotele", Revue d'Histoire des Textes, XII, 2017, 35-58. ^ Robert Maynard Hutchins (1952), Great Books of the Western World 8: Aristotle, p. 495. ^ E.g. J.A.K. Thomson, The Ethics of Aristotle, (Penguin, 1953) p. 13 and E. Barker The Political Thought of Plato and Aristotle (Dover, 1959) p. 65. ^ I read the Metaphysics [of Aristotle], but I could not comprehend its contents, and its author's object remained obscure to me, even when I had gone back and read it forty times and had got to the point where I had memorized it. In spite of this I could not understand it nor its object, and I despaired of myself and said, "This is a book which there is no way of understanding." But one day in the afternoon when I was at the booksellers' quarter a salesman approached with a book in his hand which he was calling out for sale. (...) So I bought it and, lo and behold, it was Abu Nasr al-Farabi's book on the objects of the Metaphysics. [probably the Kitab al-huruf, ed. by Muhsin Mahdi as Alfarabi's Book of Letters (Beyrouth, 1969).] I returned home and was quick to read it, and in no time the objects of that book became clear to me because I had got to the point of having memorized it by heart. (William E. Gohlam (ed.). The Life of Ibn Sina, Albany, State of New York University Press, 1974, pp. 33-35). ^ Cited by Foster, in his translation of Aquinas' commentary on the De Anima, Indiana 1994. Greek text with commentary: Aristotle's Metaphysics. W. D. Ross. 2 vols. Oxford: Clarendon Press, 1924. Reprinted 1953 with corrections. Greek text: Aristotelis Metaphysica. Ed. Werner Jaeger. Oxford Classical Texts. Oxford University Press, 1957. ISBN 978-0-19-814513-4. Greek text with English: Metaphysics. Trans. Hugh Tredennick. 2 vols. Loeb Classical Library 271, 287. Harvard U. Press, 1933-35. ISBN 0-674-99299-7, ISBN 0-674-99317-9. Aristotle's Metaphysics. Trans. Hippocrates Gorgias Apostle. Bloomington: Indiana U. Press, 1966. Aristotle's Metaphysics. Translated by Sachs, Joe (2nd ed.). Santa Fe, N.M.: Green Lion Press. 2002. ISBN 1-888009-03-9. .
Aristotle's Metaphysics. Translated by Lawson-Tancred, Hugh. Penguin. 1998. ISBN 0140446192. Copleston, Frederick, S.J. A History of Philosophy: Volume I Greece and Rome (Parts I and II) New York: Image Books, 1962. Volume IV: Reception and Criticism, ISBN 978-3-9820267-0-1, Saldenburg 2018. Commentary on Aristotle's Metaphysics. Dominican House of Studies in Washington, D.C. (in Greek, Latin, and English). voll. 3. Translated by Aquinas, Thomas; Rowan, John P. ; William of Moerbeke (1st ed.). Chicago: Henry Regnery Company (Library of Living Catholic Thought). 1961. OCLC 312731. Archived from the original on Oct 28, 2011 – via archive.org. (rpt. Notre Dame, Ind. : Dumb Ox, 1995). Wikimedia Commons has media related to Metaphysics (Aristotle). Available bundled with Organon and other works – can be downloaded as .epub, .mobi and other formats. English translation and original Greek at Perseus. Translation by Hugh Tredennick from the Loeb Classical Library. Averroes' commentary on the Metaphysics, in Latin, together with the 'old' (Arabic) and new translation based on Moerbeke. Digitized at Gallica. Cohen, S. Marc. "Aristotle's Metaphysics". In Zalta, Edward N. Stanford Encyclopedia of Philosophy. This page was last edited on 13 March 2019, at 00:33 (UTC).